MINI since its first release has been creating models with it’s out of the box thought. The same reflection from the house won several hearts (including us) when they unveiled their all new MINI Superleggera Vision Concept 2014. Upon the very first sight of this new concept you’ll feel the taste of Italian flair blended with British style. Let us have a closer look at the vision MINI has for its future production models with this classic touch of legacy they have come up this time. 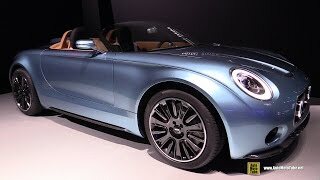 The most realistic sign of the MINI Superleggera Vision Concept 2014 to be a production model is it does not have anything which most of the concept these days come with. Looking at the interior of MINI Superleggera Vision Concept you’ll feel the retro flowing into your veins. Entire cabin holds the touch of classic taste. Leather and aluminum work throughout the cabin undoubtedly makes it comfortable and catchy. A classic three spoke steering wheel back from the pages of history holding everything about cars gets life here in this concept. Each and everything in the interior will revive the smooth blend of ages we failed to see with the comfort of today’s era. First thing to surprise you while looking at exterior of MINI Superleggera Vision Concept 2014 is the path they deviated; we mean from a hatchback to a long hood and shorter deck roadster. The exterior is designed very well and we must say this in particular if turns to be a production model (we personally wish it does) then the owner will mark an entirely different presence through out. Reasons being you don’t find such models (not even as concept) these days. Oval shaped wide headlights and all new grille commendably adds to the theme MINI desired or planned while portraying this concept. In all the only reason behind being short of words about the exterior of MINI Superleggera Vision Concept 2014 is, we are speechless over the athletic and sporty look it carries with the blend of history most of us failed to see. MINI didn’t reveal any drivetrain specifications of MINI Superleggera Vision Concept 2014 till date and for such a model perceptions really don’t work. All we can do is sit back and wait till the time MINI release the statistics.